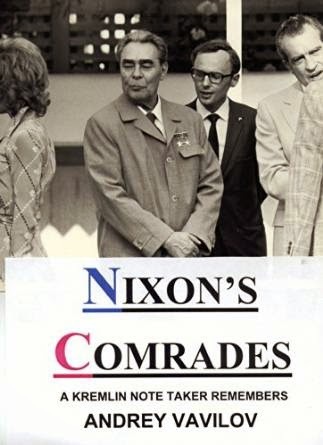 I have just finished one of the best books I have read this year and possibly this century - Nixon's Comrades. Nixon was clearly a complex figure and it is difficult to know how history might have portrayed him had Watergate not happened. As I have said in previous blogs he achieved a lot of positive actions the setting up of EPA, supporting the establishment of UNFPA and UNEP. America could have had universal health coverage in 1972 if they had accepted the proposal he put forward - similar to what Obama did in 2008 - 36 years later - bringing China into the family of nations as a UN member. This book also shows the role he played in making the world a little safer. I grew up during the cold war and the real threat of a nuclear summer. MAD for us was not only a great marvel comic but stood for Mutely Assured Destruction (MAD). The book also gives fascinating insights of the supporting characters such as Kissinger(the Russians called him Terminator) and Gromyko and the role they also took. For a short period the world did have two super powers and they negotiated as such. After Nixon the US returned to an arms race and that did under President Reagan cause the bankruptcy of the USSR trying to keep parity. The book is full of wonderful quotes I particularly like the one from Andrei Gromyko: "For a diplomat its better to remain silent on a hundred occasions than to say something silly once...Better ten years of negotiations than one day of war." it reminds of John F Kennedy's warning from the early 1960's: "Let us never negotiate out of fear. But let us never fear to negotiate." Nixon described the three men facing him across the table in a fascinating way. He described Podgorny as "a Midwestern senator," Kosygin a Communist "aristocrat", and Brezhnev "a big Irish boss" or Chicago "Mayor Daley." It helped me in understanding the people I had little knowledge of. I could start to see these people and understand how they might be approaching the negotiations based on my understanding of US politicians - bizarre . Finally I strongly recommend this book for those who lived through the cold war but also for those that didn't. this generation should understand what has happened in the past as it often informs the way we should address issues in the future. Nixon's Comrades is only available as a kindle download I hope you have as much enjoyment reading it as I have. 5* a must read book. I found this Book very interesting with regards to the views of the personal style and type of person Leonid Brezhnev was as recounted by Andrey Vavilov .... The work involved when translating is really something .... I would recommend this book to anyone interested in the Cold War !! !